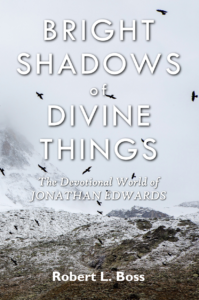 Building on his earlier work in God-Haunted World, Bright Shadows of Divine Things: The Devotional World of Jonathan Edwards intends to foster a devotional frame of mind—attentiveness and contemplation in our everyday lives, on every occasion. There are manifold reminders of God’s presence around us if we would only take time to ponder them. The great American theologian Jonathan Edwards believed that all of reality—creation, events, history—are filled with communication which confirms the Bible. It is Boss’s hope that this book will help readers tune in, like early Evangelicals, to the symphonic harmony of all creation and to the BRIGHT SHADOWS of DIVINE THINGS that point to the teachings of the Holy Scriptures. Robert L. Boss (2017). 5.25 x 8 inches, Paperback, 170 pages. Re-opens a window to an enchanted world that confirms the teachings of the Bible—many Scripture references.